Brickwork / Blockwork - Flintwork - Estimating - Full Tender Enquiries - Budgeting - Renovation Works - Refurbishment Works - Thin Joint Blockwork - Brick Cutting. Here at Osborn and Kent Construction we pride ourselves in the service we provide by our team of skilled bricklayers to both commercial and private clients across the region. With a combined experience of over 50 years in all aspects of building work, we can offer you everything you require, from estimating stage to full tender enquiries, budgeting and working to a deadline. All delivered with a professional and quality service. We are fully insured and compliant with all current Health and Safety legislations. "The Sucess of this Phase could not have been achieved without the hard work from you and your staff, and we would like to pass on our thanks and that of our site team to all concerned." 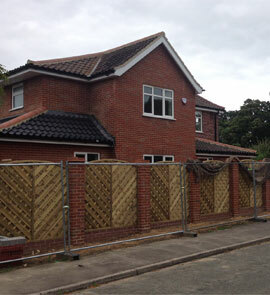 "The end result looks great and Freebridge are very happy with the finished product. We hope to be in touch with you soon regarding the next phase."